The Tampa Bay Times reports that Tampa Electric may have to raise its rates to comply with the new federal EPA mandates to reduce CO2 emissions. Tampa Electric customers could see higher electric bills under the proposed federal emission standards for coal-fired power plants, which produced 60 percent of the utility's power in 2013. The utility already uses several technologies to cut carbon emissions at its coal plants. Still, it expects to have to make changes in its operations that will affect the pocketbooks of its 700,000 customers. Tampa Electric heritage is in coal-powered electric generation, although they have converted quite a bit over to US produced natural gas in the last few years, they are the most coal dependent electric utility in the state. Natural gas is cheaper than coal these days, and emits about half the amount of CO2 as coal. President Barack Obama's administration announced the sweeping new emissions standards Monday to help curb pollutants blamed for climate change. The rules, outlined in a 645-page document, won't go into effect for at least a year. The goal is to cut power plants' carbon emissions by 30 percent from 2005 levels by 2030. Only 645 pages? What are we paying for up there in DC? Of course, once the final rules and regulations are passed, state by state, it will explode into the tens of thousands pages. Florida already has made significant strides toward reducing coal plant emissions. The Georgetown Climate Center at the Georgetown University Law School in Washington, D.C., notes in its review of Florida's electricity production that the Sunshine State cut its carbon emissions 15 percent between 2005 and 2012. Electricity produced from coal dropped about 40 percent during that period. How did that happen? No recent government rules, regulations or Kyoto protocols drove down those reductions in carbon emissions. It was the free market, new drilling technologies such as horizontal drilling and fracking that freed up the natural gas, and driving fuel prices down, making it an easy, cost effective decision for the power companies to adopt. Meanwhile, how bad its our air? It's not, in fact it's pretty good, and continues on an improving trend. We answered that question last year. We have more good news on that front. Gov. Rick Scott's office on Monday touted Florida's air quality. "Thanks to efforts to curb air pollution statewide, Florida air emissions are the lowest on record. The Florida Department of Environmental Protection will review the EPA's proposal and will work to continue to protect Florida's environment," said Scott's spokesman, John Tupps. Last month, DEP officials said emissions of key industrial pollutants that contribute to the formation of ozone and fine particulate matter continued to decline in the state, and that power plant emissions of sulfur dioxide and nitrogen oxides decreased 83 percent over the last decade. Closer to home, more good news. 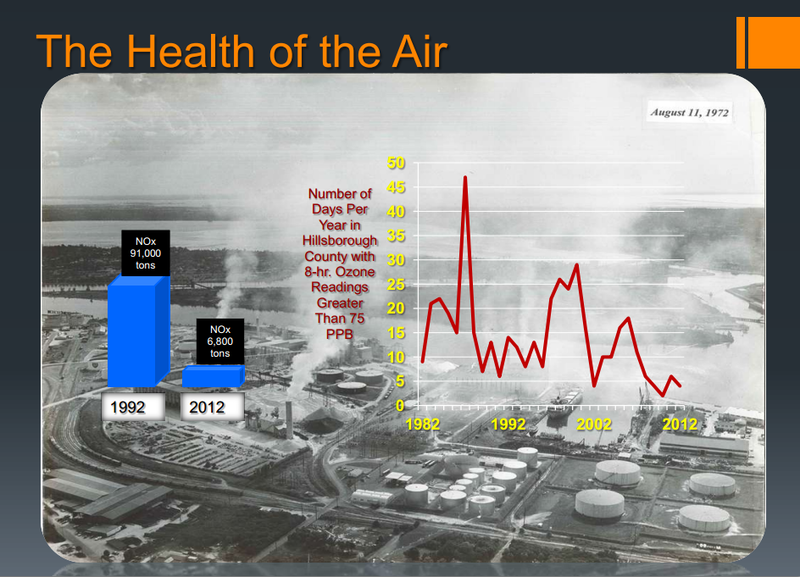 Our air is much cleaner that it was a couple of decades ago. The 2013 Hillsborough Environmental Protection Commission annual report also noted dramatic improvements. So how much CO2 do we have? We should know the starting point in Hillsborough if our Tampa Electric is expected to retool much of their power generation to reduce CO2 levels. Surely the Hillsborough EPC has tracked CO2 over the the years. If they have measured CO2 it's not available in the EPC's Air Quality technical reports. This begs the question about how bad things really are, especially given the improvements in air quality over the last few decades. Just how clean must it be? Just how much more expensive will it get? Exactly how will we benefit? The EPA mandate is not a cap on CO2 emissions, although it has elements for potential inter-state cap and trade. India, China, and other global emerging economies will not penalize their economic growth by restricting CO2 emissions so CO2 will continue to rise globally despite the EPA mandates. This is only a cap on our personal earnings and the U.S. GDP. The U.S. Chamber of Commerce has warned these regulations will cost jobs and reduce disposable income. The impacts of higher energy costs, fewer jobs, and slower economic growth are seen in lower real disposable income per household. … The loss of annual real disposable income over the 2012-30 period will average over $200, with a peak loss of $367 in 2025. This translates into a shortfall in total disposable income for all U.S. households of $586 billion (in real 2012 dollars) over the next 17 year period 2014-30. Even Democrats are starting to understand their own vulnerability on the EPA mandate. Even in areas less dominated by coal, vulnerable Democrats criticized Mr. Obama for acting without congressional approval to advance his agenda. They sought to do so carefully to avoid alienating the party's base, which generally supports efforts to combat climate change. They'll need a lot more than "distancing" to save themselves. How about they focus on their constituents jobs and state's economy? But then again, there's Barbara Boxer. "Thank goodness the president refuses to be bullied by those who have their heads in the sand, and whose obstruction is leading us off the climate change cliff," said Sen. Barbara Boxer (D., Calif.). Head in the sand? Sounds like she's got her head up her *ss! We are all California now. Not only will this mandate waste your money, it won't actually do anything for global C02 emissions. Where will this lead? Clearly more expensive electric bills. Everything else -- food, goods, cost of living, etc. -- that depend on electric power will increase. Electric utilities will likely convert more power generation to natural gas, which will lead to more fracking. Environmentalists will fight that, so we'll have more anti-fracking activists emerge. If the power conversion is not done right, there is an increasing risk of more brown outs and black outs. If we're lucky, we'll get to watch some interesting internecine battles between the energy state Democrats and the environmental elitist wing of the party. Yet global CO2 emissions will continue to rise. We get to pay for it. All for nothing.